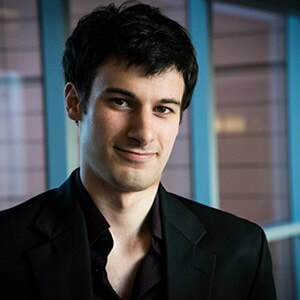 Born in Rhode Island, second-year Violin Fellow Gregory Cardi began playing the violin at the age of six and made his solo debut with orchestra by age ten. After serving as concertmaster of the Boston Youth Symphony, he attended the Walnut Hill School under the tutelage of the late Masuko Ushioda. Mr. Cardi has appeared at the Aspen Music Festival, Tanglewood Music Center, Kneisel Hall Chamber Music Festival, Pacific Music Festival, New York String Orchestra Seminar, Sarasota Music Festival and the Music Academy of the West. A passionate orchestral musician, Mr. Cardi has served as concertmaster of the Pacific Music Festival and Tanglewood Music Center orchestras, and assistant concertmaster of the Juilliard Orchestra. He has taken part in master classes with the concertmasters of the New York Philharmonic, Boston Symphony and Vienna Philharmonic. His chamber and solo engagements have taken him to Carnegie Hall, Harvard’s Sanders Theatre, The Los Angeles County Museum of the Arts and Tanglewood’s Seiji Ozawa Hall. Mr. Cardi has been featured on ABC 7 with Linda Carson, Sundays Live with the American Youth Symphony, and hailed as “captivating” by WSMR Sarasota. An aspiring teacher, he was chosen to be part of a highly selective group of Colburn Teaching Fellows, led by renowned “Psychology Of Learning” professor, Robert Duke. Mr. Cardi received his bachelor of music degree from The Colburn School under the tutelage of Robert Lipsett, and recently finished his master of music degree at The Juilliard School with Catherine Cho and Metropolitan Opera concertmaster David Chan. He plays on a 1699 Grancino violin and Paul Siefried bow on generous loan from the Maestro Foundation.